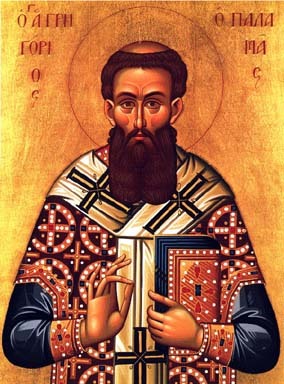 Light of Orthodoxy, pillar and doctor of the Church, adornment of monks, invincible champion of theologians, O Gregory the wonderworker, praise of Thessalonica, preacher of grace, ever pray that our souls may be saved. Organ of wisdom, holy and divine, bright clarion of theology, we praise thee in harmony, O divine speaker Gregory: But as a mind standing before the First Mind, direct our mind to Him, father, that we may cry: Rejoice, preacher of grace! 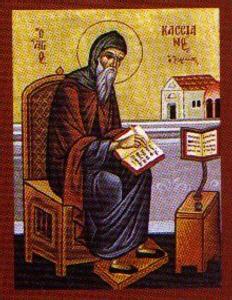 In thy divine teachings thou wast a physician for souls, O Father Cassian,/ and setting aright the thoughts of monastics by grace,/ thou didst lead them to life everlasting./ Wherefore, we all honor thee with love. Having delighted in discipline, abstinence, and continence,/ O divinely wise one,/ and having bridled your carnal desires,/ you were seen increasing in faith./ And you flourished like the tree of life in the midst of Eden,/ O all-blessed, most sacred Father Cassian. Note: St. John’s feast day is actually 29 February, but is translated in non-leap-years to 28 February. St John’s The Institutes (begin) and The Conferences (begin) are among his most well-known works, but he also has an anti-Nestorian work On the Incarnation (begin). St. John is also falsely by some in the West labelled a semi-Pelagian, and his synergisitic understanding of grace called a heresy. I defend him against such misunderstandings and calumny in my “St John Cassian: On Grace and Free Will” (a part of the soteriology diablog). and restored the fallen image to its former beauty. About the icon of the triumph of Orthodoxy. Orthodox teaching about icons was defined at the Seventh Ecumenical Council of 787, which brought to an end the first phase of the attempt to suppress icons. That teaching was finally re-established in 843, and it is embodied in the texts sung on this Sunday. Deacon: This is the faith of the apostles! This is the faith of the fathers! This is the Orthodox faith! This faith has established the universe! Furthermore, we accept and confirm the councils of the holy fathers, and their traditions and writings which are agreeable to divine revelation. And though the enemies of Orthodoxy oppose this providence and the saving revelation of the Lord, yet the Lord has considered the reproaches of His servants, for He mocks those who blaspheme His Glory, and has challenged the enemies of Orthodoxy and put them to flight! To those who deny the existence of God, and assert that the world is self-existing, and that all things in it occur by chance, and not by the providence of God, Anathema! Deacon: To those who say that God is not spirit, but flesh; or that He is not just, merciful, wise and all-knowing, and utter similar blasphemies, Anathema! To those who dare to say that the Son of God and also the Holy Spirit are not one in essence and of equal honor with the Father, and confess that the Father, and the Son, and the Holy Spirit are not one God, Anathema! To those who foolishly say that the coming of the Son of God into the world in the flesh, and His voluntary passion, death, and resurrection were not necessary for our salvation and the cleansing of sins, Anathema! To those who reject the grace of redemption preached by the Gospel as the only means of our justification before God, Anathema! To those who dare to say that the all-pure Virgin Mary was not virgin before giving birth, during birthgiving, and after her child-birth, Anathema! To those who do not believe that the Holy Spirit inspired the prophets and apostles, and by them taught us the true way to eternal salvation, and confirmed this by miracles, and now dwells in the hearts of all true and faithful Christians, and teaches them in all truth, Anathema! To those who reject the immortality of the soul, the end of time, the future judgment, and eternal reward for virtue and condemnation for sin, Anathema! To those who reject all the holy mysteries held by the Church of Christ, Anathema! To those who reject the Councils of the holy fathers and their traditions, which are agreeable to divine revelation and kept piously by the Orthodox Catholic Church, Anathema! To those who mock and profane the holy images and relics which the holy Church receives as revelations of God’s work and of those pleasing to Him, to inspire their beholders with piety, and to arouse them to follow these examples; and to those who say that they are idols, Anathema! To those who dare to say and teach that our Lord Jesus Christ did not descend to earth, but only seemed to; or that He did not descend to the earth and become incarnate only once, but many times, and who likewise deny that the true Wisdom of the Father is His only-begotten Son, Anathema! To the followers of the occult, spiritualists, wizards, and all who do not believe in the one God, but honor the demons; or who do not humbly give their lives over to God, but strive to learn the future through sorcery, Anathema! Thou wast the Church’s instrument/ in strengthening the Church’s teaching of true doctrine;/ thou didst shine forth from the West like a sun/ and didst dispel the heretics’ error./ O righteous Leo, entreat Christ our God to grant us His great mercy. From the throne of thy priesthood, O glorious one,/ thou didst stop the mouths of the spiritual lions;/ thou didst illumine thy flock with the light of the knowledge of God/ and with the inspired doctrines of the Holy Trinity./ Thou art glorified as a divine initiate of the grace of God. While I have previously here remarked on the fact that both my patrons saints left academia to pursue monastic vocations, it took the jest of a friend and co-worker to cause me to wonder if my leaving academia more than two years ago was, in fact, perhaps inevitable. Since, after all, both my patron saints left academia, isn’t there some sort of spiritual gravitational pull impacting me in that regard? bearing a temple of the body all defiled. But in Thy compassion, cleanse it by the loving-kindness of Thy mercy. but by thine intercessions deliever me from all uncleanness. And according to the multitude of Thy compassions, blot out my transgressions. Both now and ever and unto ages of ages, Amen. establish and grant understanding unto my heart, O Master. O Merciful One, have mercy on me who have fallen. And that, knowing the time, that now it is high time to awake out of sleep: for now is our salvation nearer than when we believed. The night is far spent, the day is at hand: let us therefore cast off the works of darkness, and let us put on the armour of light. Let us walk honestly, as in the day; not in rioting and drunkenness, not in chambering and wantonness, not in strife and envying. But put ye on the Lord Jesus Christ, and make not provision for the flesh, to fulfil the lusts thereof. Him that is weak in the faith receive ye, but not to doubtful disputations. For one believeth that he may eat all things: another, who is weak, eateth herbs. Let not him that eateth despise him that eateth not; and let not him which eateth not judge him that eateth: for God hath received him. Who art thou that judgest another man’s servant? to his own master he standeth or falleth. Yea, he shall be holden up: for God is able to make him stand. For if ye forgive men their trespasses, your heavenly Father will also forgive you: But if ye forgive not men their trespasses, neither will your Father forgive your trespasses. Moreover when ye fast, be not, as the hypocrites, of a sad countenance: for they disfigure their faces, that they may appear unto men to fast. Verily I say unto you, They have their reward. But thou, when thou fastest, anoint thine head, and wash thy face; That thou appear not unto men to fast, but unto thy Father which is in secret: and thy Father, which seeth in secret, shall reward thee openly. Lay not up for yourselves treasures upon earth, where moth and rust doth corrupt, and where thieves break through and steal: But lay up for yourselves treasures in heaven, where neither moth nor rust doth corrupt, and where thieves do not break through nor steal: For where your treasure is, there will your heart be also. Turn not away Thy face from Thy servant for I am afflicted! Attend to my soul and deliver it! Listen to the unique melody of this verse–to this cry that suddenly fills the church: “. . . for I am afflicted!”–and you will understand this starting point of Lent: the mysterious mixture of despair and hope, of darkness and light. All preparation has now come to an end. I stand before God, before the glory and the beauty of His kingdom. I realize that I belong to it, that I have no other home, no other joy, no other goal; I also realize that I am exiled from it into the darkness and sadness of sin, “for I am afflicted!” And finally, I realize that only God can help in that affliction, that only He can “attend to my soul.” Repentance is, above everything else, a desperate call for that divine help. As We Bid Farewell to Cheese . . .
Oh, shredded three-cheese blend, so wonderfully melted between tortillas and over scrambled eggs, I hardly knew thee!